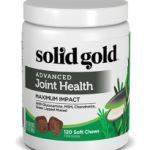 Solid Gold has just released a BRAND NEW supplement for advanced joint support! This easy-to-feed chew is stacked with supportive, functional ingredients. Maximum impact recipe | Ideal for seniors, overweight dogs or dogs with advanced joint issues. Helps maintain strong bones & healthy cartilage | Fosters healthy joint function & mobility, promotes a healthy joint fluid viscosity & supports the structural integrity of joints & connective tissues. Powerful natural ingredients | Glucosamine, MSM & Chondroitin promote health joint fluid viscosity. Green Lipped Mussel, Boswellia Serrata & Yucca Schidigera help ease joint stiffness & promote joint health. Delicious, convenient chew | Great for picky dogs! 120 count jar provides 1 month supply for 40-79lb dog. See packaging for dosage recommendations by weight. Brewer’s Dried Yeast, Canola Oil, Dried Potato Product, Flaxseed, Glycerin, Lecithin, Maltodextrin, Mixed Tocopherols, Natural Flavorings, Rosemary Extract, Sorbic Acid, Tapioca Starch, Vegetable Oil, Water. 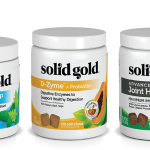 Learn more about Solid Gold’s new collection of Supplement Chews here. All chews come 12 to a case. A mix & match ISO is available at Northland. We welcome your questions to determine which of these exciting new chews might be a good fit for your store. 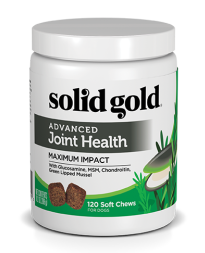 Solid Gold offers a complete line of health products for pets, including food, supplements and treats to promote your pet’s health. Solid Gold specializes in the development of “non-allergenic” products, which work together to enhance total health, boost the immune system and protect against disease. Be sure to stay connected to us: sign up to receive our email news and promotions & follow us on Facebook.